If you ever wondered just how miserable Virginia Woolf had to be to drown herself in the River Ouse by walking into the water after filling her overcoat pockets with stones, Priya Parmar reveals the quirky personality behind the disturbed genius as she examines the lives of sisters Virginia Woolf and Vanessa Bell in Vanessa and Her Sister. The timeline covers their young adult lives at Bloomsbury – before either had achieved fame through literature or art, and ends as Virginia Stephen marries Leonard Woolf. “In the winter of 1905, in the London neighborhood of Bloomsbury, a group of friends began meeting for drinks and conversation that lasted late into the night. The friends – writers like Lytton Strachey, artists like Roger Fry and thinkers like economist John Maynard Keynes — continued to meet almost weekly for many years. Eventually, they came to be known as the Bloomsbury Group. In the beginning, their clubhouse was the home of the Stephen siblings — two brothers and two sisters. Today, the women are better remembered than their brothers: They were the painter Vanessa Bell and the writer Virginia Woolf. The sisters live with their brothers after the death of their parents, and through the weekly salon, the reader meets their friends, future husbands and a circle of recognizable literary luminaries – E.M. Forster, Rupert Brooke, Walter Lamb, and others. Famous artists – Monet, Manet, Picasso, and others float through the periphery of the story, as Vanessa Stephen, an artist in her own right, marries Clive Bell, the art critic and author, who organized the landmark second Post-Impressionist exhibition that was held in London in 1912. Through a series of letters, and diary notes, Parma weaves a tale of sisterly love and sibling rivalry, telling the background story of the famous sisters and creating a fictional conversation based on historical fact. If you are a fan of embellished historical fiction in the tone of “The Girl with a Pearl Earring,” you might enjoy the book, but beware – Parmar’s unique writing style might be a distraction. Not quite an epistolary, the story uses Vanessa’s diary posts (Vanessa never actually kept a diary), letters between the authors and friends, as well as letters between Vanessa and her sister Virginia. At times, the jumps from intimate thoughts from the journal to letters from assorted characters can be disarming. You will need to concentrate on who is talking. Although I have read Woolf’s writing and knew of her background, Parmar’s creation through the eyes of Woolf’s sister was enlightening. Despite Virginia’s overbearing proclamations of the value of writing over art, Vanessa rallied on with her painting and eventually became renowned in the art world. Although some of her paintings were destroyed in a fire, many remain on display. Her son, Julian Bell, has carried on the tradition of writing and painting. Parmar touches on the birth of Julian and the sham of Vanessa’s marriage, but her affair with Roger Fry and his influence on her work will have to wait for another novel. Leonard Woolf appears as Virginia’s suitor through letters to a mutual acquaintance, Lytton Strachey. Their married life together, his subsequent influence and care of her delicate nature, as well as their founding of the Hogarth Press – which published most of Virginia’s novels – is well documented in Victoria Glendenning’s 2006 biography – Leonard Woolf – a book I now have on my list to read. Parmar only briefly mentions Leonard, and left me wanting more. As Virginia’s erratic behavior leads to her brief institutionalization, I wondered how he could continue to pursue her…but there is more to that story. 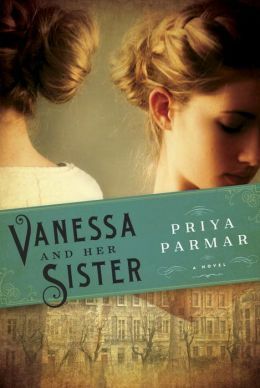 The sibling rivalry and forbearance of Vanessa toward her talented sister form the crux of this novel, and Parmar does highlight the “unheard” sister by speaking through the voice of Vanessa Stephen Bell. By using primary sources and then fictionalizing Vanessa’s life, Parmar may have filled the gap for more information with a psuedo biography on the Vanessa with the famous sister.